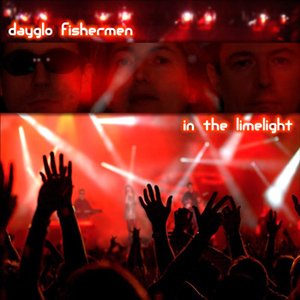 Dayglo Fishermen's new album, 'In the Limelight', has been released! The album, recorded in February 2008 at the Limelight Theatre in Aylesbury, UK, is the band's first ever live album. The album features 14 of the band's most popular songs, including the thought-provoking 'Something's Watching', the spine-chilling 'Voodoo', the moving 'My Friend' and the foot-tapping 'Passion'. 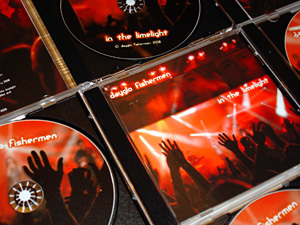 Recorded faithfully in sparkling 24-bit digital audio, the album is currently the only way to enjoy the raw, dynamic and emotive experience of Dayglo Fishermen live in concert. The full album is available to download now from the music page. Each track is unedited and has no fade out, so why not download them all, stitch them together, and then listen to the full 78 minute concert in unbroken glory? If you would like to own a CD copy of the album (shown below), send an email to Dayglo Fishermen and request ordering details.